Happy 15th Birthday to my sweet Tanner. Tanner is a loving boy and so tolerant. He enjoys a good snuggle on the couch and sleeps right next to you at night. He wants to be touching you. He loves his brothers but enjoys some playtime alone as well. He is very good at taking turns when we play. His favorite toys right now are catnip pillows, and his "girl" string. Tanner always comes over when we are eating dinner or lunch. He wants to know what you are having and see if it is something he needs. You can always count on him being there! Thankfully, no one else has picked up this habit! Tanner is living every day to the fullest. I am thankful for all the extra time I've been given with him, and will cherish every moment. Happy Birthday to my one and only orange boy! Happy Birthday Tanner!!! You are such a sweetie and so handsome too. 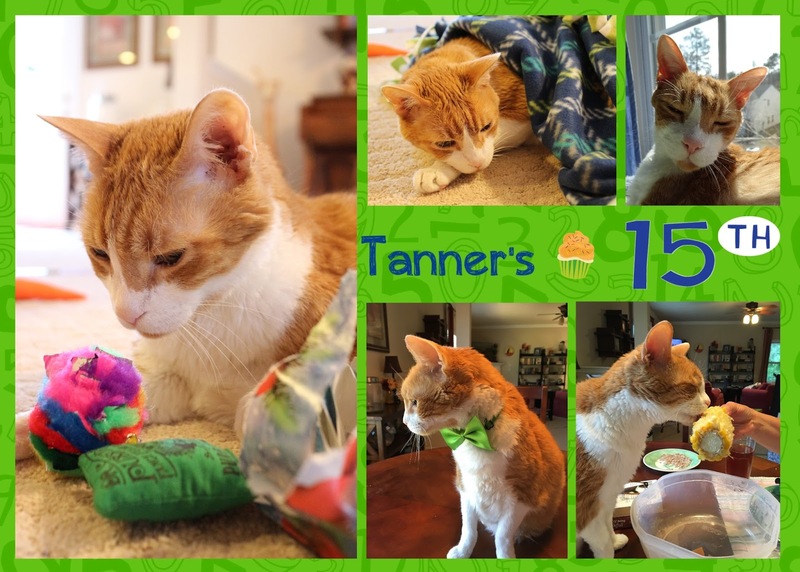 Happy Meowday gawjus Tanner. We hope your day is as purrfect as you. Happy birthday, Tanner! So glad you are able to enjoy each day with your family. Happy birthday to Tanner! You are really a miracle kitty. Happy Birthday, Tanner! We hope you're having a great day. Happy birthday, Tanner! We hope your day is super special ... just like you! Happy birthday, Tanner ! You are one special orange boy !